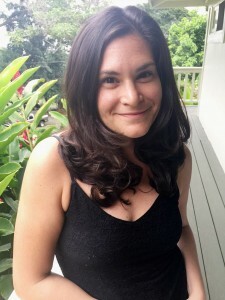 Jaimie Gusman is a freelance writer in Kaaawa, HI and founder of Mixing Innovative Arts, Honolulu’s longest running reading series. Jaimie has three chapbooks: Gertrude’s Attic (Vagabond Press, 2014), The Anyjar (Highway 101 Press, 2011), and One Petal Row (Tinfish Press, 2011). Her work can also be found in the journals Moss Trill, The Feminist Wire, Sonora Review, BODY Magazine, Trout, Mascara Review, Unshod Quills, LOCUSPOINT, Capitalism Nature Socialism, Hearing Voices, Hawaii Women’s Journal, Spork Press, Shampoo, Barnwood, DIAGRAM, 2 River Review, and others. She is on the web at http://jaimiegusman.com/. Jaimie Gusman Black Radish title, Anyjar, is available through SPD. and I, inside and removed. the narrative of invisible glass. the exit, but the knocks are mute. its woodenness warps its wood.